Grace Notes: Red Hot Chilli….. Pipers? 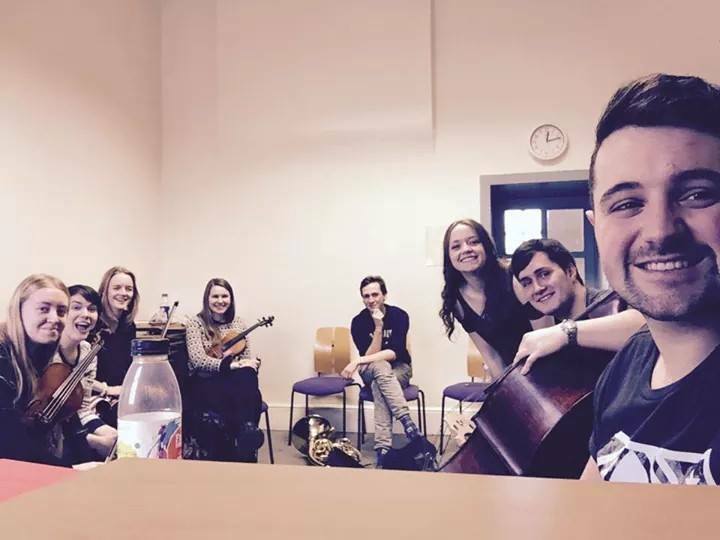 Last week, while taking part in the CoLab Ceilidh band (here is a link to last weeks blog post if you’re interested) we spent some of our time watching Ceilidhs on YouTube. This rapidly turned into sharing videos of folk music we liked and one of the members of the band showed us this. These are the Red Hot Chilli Pipers. They were formed in 2002 and their first festival appearance was with a cameo performance at T in the Park with The Darkness in 2004. They fuse traditional Scottish music with Rock/Pop song (they call it ‘Bagrock’). In 2007 they won the BBC talent show ‘When Will I be Famous’ and have since had concerts and TV appearances worldwide. They have even appeared on the soundtrack to ‘How to Train Your Dragon 2 (which has a great soundtrack even without the Red Hot Chilli Pipers and is an awesome film. I seriously recommend it!). I particularly like them because they are different to anything else I listen to (the ensemble is made up of pipers, drummers, guitarists and keyboard players). Not only can they ‘rock’, but they manage to fuse it with Scottish folk music brilliantly. From watching videos I can tell that their shows are incredible – the crowds love them. Because of the tuning of Bagpipes they can only play in certain keys and have a limited range. I know almost nothing about the Bagpipes but here is a link to a really interesting article explaining more. Some pop songs wouldn’t work, but the ones they choose work perfectly. I particularly like this one of ‘Don’t Stop Believing’. I hope you’ve enjoyed the discovery of the ‘Red Hot Chilli Pipers’ as much as I have! On a completely different note, there is a concert next Saturday at St John’s Smith Square featuring brass students from conservatoires all over the country. This is a chamber music concert in memory of Philip Jones who was an internationally famous British Trumpeter. If you are in the area, it should be great! Every year in Trinity Laban, there are two weeks where timetables are suspended and anything could happen… This fortnight is called CoLab. There are over 100 projects taking place over the two weeks ranging from a Ceilidh band, Bollywood Brass, Strictly Come Dancing and a project where anything and everything was allowed – except talking. 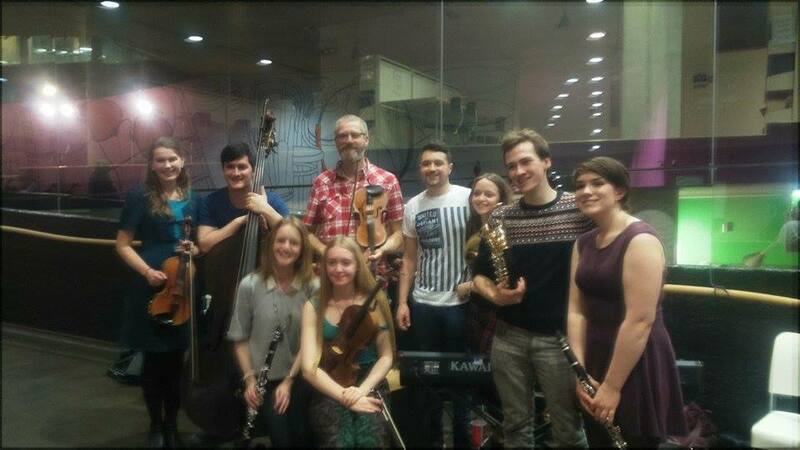 My project was the Ceilidh band. We first met last Monday. Once our mentor, Steve Blake, had arrived we talked through what we wanted out of the project. We were originally performing on the Thursday night Pub Crawl, with an impromptu Ceilidh in Greenwich Market, but due to a Hollywood blockbuster filming there we were moved to the Friday night showcase at Creekside. This was, in fact, far better for us. Not only did we have another day to rehearse but the performance space was bigger (it also wasn’t cobbled so there were no injuries should people got too carried away…..). Rather than starting the tunes with a well-rehearsed and conducted introduction, the violinist (either myself or Steve) would just play a short solo introduction. 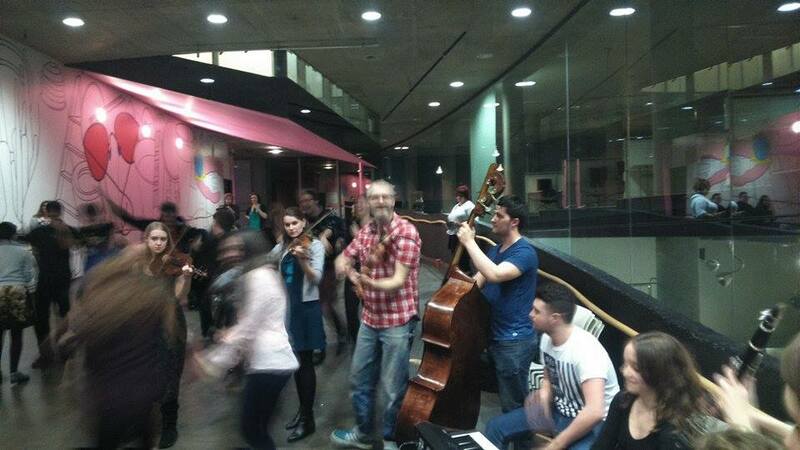 In an actual Ceilidh this gets everyone’s attention (dancers and musicians) and prepares us for the movements to start. I found that doing the introduction was an art in itself as you need to play loudly enough to be heard, but also need to have a very clear perfect cadence (or clear ending) to show exactly when the dance will begin. One person in the group is also in charge of watching the dancers and deciding how many times we play each tune through (there are 2/3 per set) and calling out or making some sort of signal that it’s time to change the track. My favourite dance was a jig set taught by Steve. There were only two tunes, but the first was played in two different keys (G and D major) before moving onto the second tune. The first tune was just called ‘Jigg’ and the second was called ‘Tom Jones’. Here is Steve playing it with one of his bands. The performance was great fun. We crafted an introduction to grab everyone’s attention, starting with a slow introduction before jumping into a fast march. We then moved onto the first dance with Joe Townsend calling. He called two dances, and then a 4th year singer called the third because he wanted to dance ‘Strip the Willow’ (this involved lots of spinning your partners and was great to watch!). After playing these three dances and a few filler pieces to give the dancers a rest, our set was over and we were exhausted. The band, exhausted after our performance! Overall it was a great week and I feel like I learnt lots about how to approach folk music and how to be a part of a Ceilidh band. After spending a week playing this sort of music, it’s increased my love of folk and made me determined to keep expanding my knowledge of this genre and finding people to play it with. If you happen to be in the Greenwich area check out the CoLab events to see if there’s anything that takes your interest. All of the projects are exciting and different and you might discover something you never thought you were a fan of! On Sunday February 8th, I attended a Wedding Fair at the beautiful Grove Hotel in Hertfordshire with Horizon String Quartet. We had a stall there and were hoping to make some new contacts. I’d never been to a Wedding Fair before, so I had no idea what to expect. Our day started early, meeting at North Greenwich at 7am! We were more than a tad groggy! After travelling across London to Watford and getting a taxi to the hotel we could finally relax and set up. We had a great spot in the Foyer of the hotel which meant we were one of the first things people saw so we grabbed their attention. We set up so that we were sat in normal quartet formation, with a table alongside us. We had a laptop with our website on it so people could have a look, flyers, business cards, prices, repertoire and a bowl of sweets (these went down particularly well….). I think when we do our next fair, we’ll not have the laptop as it didn’t seem to attract that much attention and took up a fair amount of space. Having never attended one of these before we weren’t sure whether playing or talking was the best approach. On the one hand, if people could hear us playing, they’d hopefully be impressed and hire us, but because we were playing it meant that we couldn’t answer any questions. On the other however, if we did more talking than playing, we wouldn’t jump out to the visitors as much and so might not attract as many potential customers. After an hour or so, we came to the conclusion that playing short pieces was the best option as we could talk from our seats in between pieces. I wasn’t prepared for the sheer numbers of people either. They all seemed to come in waves too. One minute we’d be sat or stood around twiddling our thumbs, and then the next all four of us would be talking to someone, describing the ensemble. We have a fantastic arrangement of ‘Let It Go’ by our first violinist and this proved particularly popular with children. It was requested many many times! Using our list of repertoire, people could request pieces they’d like to hear and this gave us a really good idea of what the public like. Often players like different things to non-musicians. For example, Pachelbel’s Canon was requested a large number of times, but as a string player it doesn’t rank high on my list of favourite tunes! It was a good bit of market research though, so now we know next time which tunes to concentrate on. We also found that although at weddings light classical music is often preferred, the pop arrangements of artists like Coldplay and Clean Bandit caught people’s attention and made them stop at our stand. I thoroughly enjoyed taking part in this Wedding Fair at The Grove. Everyone was really nice, and aside from the early start, it was all pretty relaxed and fun. I’m looking forward to our next one on March 8th at the Marriot in Regents Park. Would be great to see you if you’re in the area! On a side note, this week is the start of the annual fortnight of CoLab at Trinity Laban. 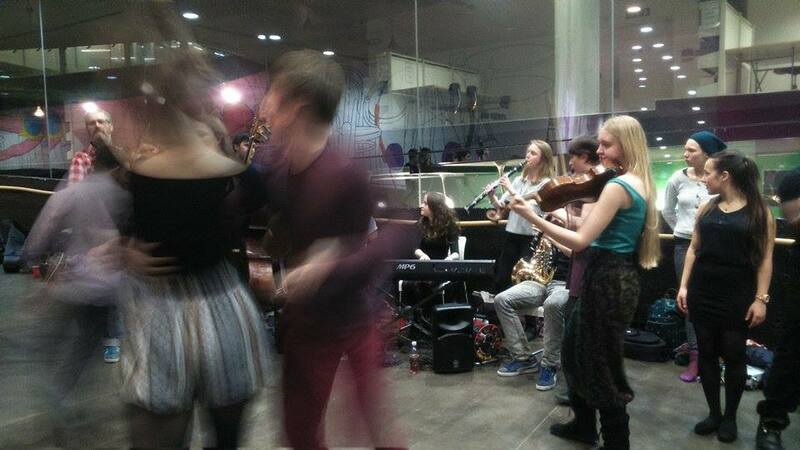 There is so much going on at both the Laban and Trinity buildings over the next couple of weeks including a pub crawl on Thursday (featuring my project the Ceilidh Band) and a showcase of projects on the Friday night of this week at Laban. If you are in the area and at a loss of what to do, check out the Trinity Laban website to see what events are going on! I can promise that it’ll be something completely different to anything you’ve ever seen before! You may wonder what a Russian composer and a scientific storehouse to prevent loss of seed types in a global crisis have in common. Quite a lot in fact! Yesterday, my Dad phoned and told me that he had heard an interesting episode of ‘The Food Program’ on BBC Radio 4. This episode was about an upcoming documentary called ‘The Grain Divide’, about how the relationship between wheat and people has changed, and what this may hold for us in the future. There was a particular section of this that especially interested me. 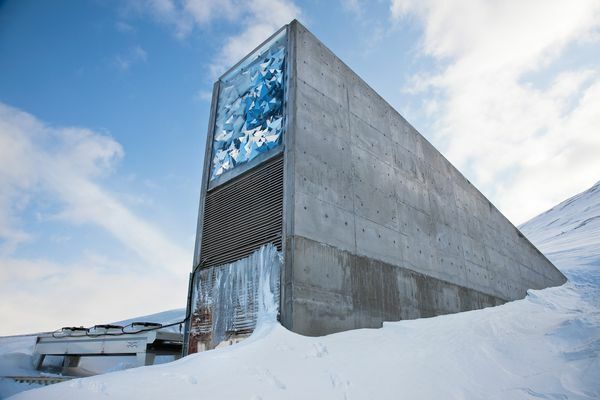 It was about Svalbard Global Seed Vault which is on the Norwegian island of Spitsbergen and was built about 7 years ago. There are three giant vaults filled with millions of seed types from all over the world, in an attempt to insure against the loss of seeds and food types in a global crisis. Following on from this, one story caught my attention. It was about Nikolai Vavilov’s seed bank in Leningrad (now St Petersburg). On the 8th September 1941 the last road to Leningrad was severed by the German Army and the siege of Leningrad began. Many things of national importance, such as the works of art and some musicians were evacuated, but the seed bank was not. A group of scientists working with Vavilov, boxed up a representative sample of this collection of 250,000 samples of seeds, roots and fruits, and protected it for the entirety of the siege, believing that once the siege ended it would be one of the only ways to help the city start up again. They refused to eat any of the contents of it, meaning that by the end of the siege in 1944, nine of the guards had died of starvation. One, who was in charge of the rice store, was found at his desk, having died of starvation, surrounded by bags of rice he hadn’t cooked and eaten to save himself. Vavilov also wasn’t very fortunate and through repeatedly insulting a biologist that earned the respect of Stalin he found himself with a prison sentence for 20 years, but ended up dying of starvation in 1943. His seed bank is now stored in the Institute of Plant Industry in St Petersburg. This got me thinking about the siege of Leningrad, and I immediately jumped to Shostakovich (who I’m sure I’ve already mentioned is my favourite composer) and his 7th Symphony. I played this with my county orchestra a few years ago and it stuck with me due to the exciting music with so much history attached. Shostakovich lived in Leningrad and was there for the first few weeks of the siege, where he wrote most of the first three movements of his 7th symphony, and completed it in December 1941. 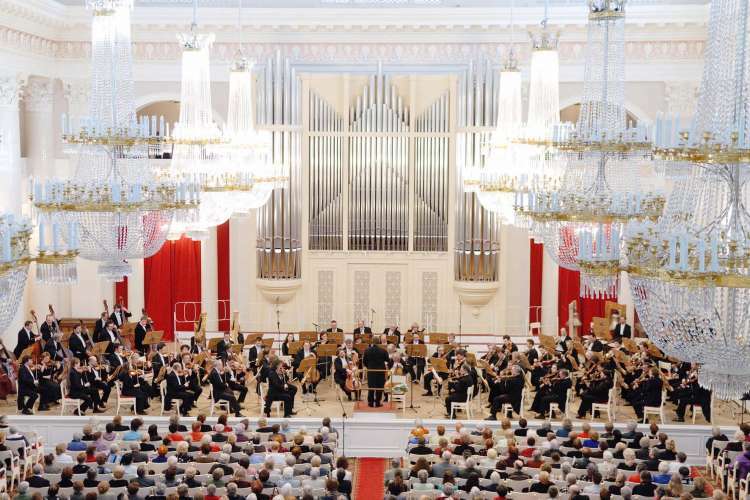 The world premier was in the Kuibyshev with the Bolshoi Theatre Orchestra, but the premier in Leningrad was something different altogether. On 9th August 1942 (the day Hitler said the city would fall) the surviving members of the Leningrad Radio Orchestra, (supplemented with survivors from the city and musicians drafted in from the military) performed Shostakovich’s 7th Symphony (nicknamed ‘Leningrad’ and dedicated to the city) to a full house at the Grand Philharmonia Hall. The people who didn’t fit in, and the soldiers on duty listened through loudspeakers and on radios. This performance was encouraged by politicians as it was seen as a morale boost to citizens and soldiers. The Leningrad Radio Orchestra was the only orchestra left in the city after the evacuation, but due to the large number of deaths in the city (mostly starvation, freezing temperatures or fighting) there were only 14 or 15 members left. Shostakovich had scored the piece for 100 players, so the organisers went to personally seek out the people who hadn’t responded due to weakness caused by starvation and illness. It is said that lots of the musicians had a new rush for life at the chance to play again, and rehearsals started when the scare had been airlifted in with supplies. The first rehearsal in March 1942, was scheduled for three hours, but had to be stopped after 15 minutes because all 30 musicians who were there, were too weak to play. The conductor Eliasberg was so unwell that he could barely conduct, had to be dragged to the rehearsal venue on a sledge and was eventually moved to live closer. To combat starvation, players were given extra rations, and hot bricks were used to heat the rooms, but three players still died during rehearsals. Posters went up and people were called in to play from all over the city to supplement the orchestra. They rehearsed from 10-1, six days a week, but often were interrupted by air raid sirens. Before the performance, there was only one complete run of the symphony on 6th August. In order to hide the shivering caused by starvation, the musicians were bundled up in lots of layers (like ‘cabbages’). When they felt they couldn’t continue playing due to exhaustion, the audience stood up to spur them on. The performance ended with an hour long standing ovation. Even a German General, sat in the trenches heard the broadcast and later said ‘When it finished I realized that never ever shall we be able to enter Leningrad. It is not a city that can be conquered’. Seeing stories like this make me realise how lucky we are now. When I go to rehearsals there aren’t people missing because they missed one too many meals. We don’t have to cover up our shivering from audiences. We don’t have to heat our halls with bricks in order to survive. For the past week we have been celebration Winston Churchill’s leadership in our country during the Second World War. However, we also need to remember that the war was also won by the courage of ordinary citizens trying their best to carry on in horrific circumstances, like the botanists and musicians of Leningrad.